So what are these acceptable failures and what does 5% really mean. Failures can happen when we have tests which fail randomly, usually poorly written tests or tests which have been written a long time ago and hacked to work in todays environment. This doesn’t mean any test that fails is a problem, it could be a previous test that changes a Firefox preference on accident. For Android testing, this currently means the browser failed to launch and load the test webpage properly or it crashed in the middle of the test. Other failures are the device losing connectivity, our host machine having hiccups, the network going down, sdcard failures, and many other problems. With our current state of testing this mostly falls into the category of losing connectivity to the device. For infrastructure problems they are indicated as Red or Purple and for test related problems they are Orange. 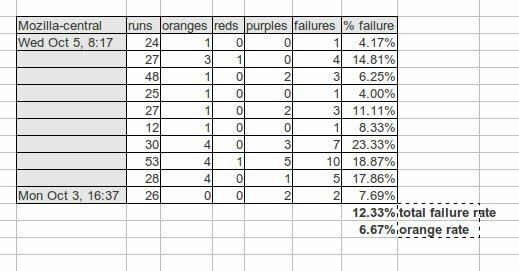 Here you can see that our tests are causing 6.67% of the failures and 12.33% of the time we can expect a failure on Android. 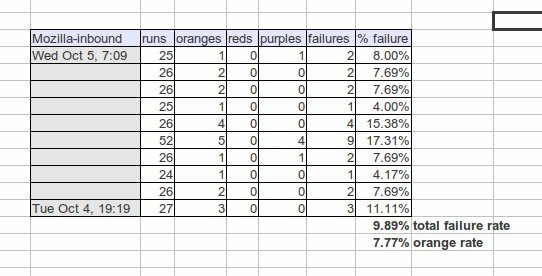 Here you can see that our tests are causing 7.77% of the failures and 9.89% of the time we can expect a failure on Android. This is only a small sample of the tests, but it should give you a good idea of where we are. And a couple weeks ago, it was what? 50%? more? heh, we were at 100% failure for almost a week while fennec crashed on startup. I thought we were at 15% failure rate by looking at tbpl and a few weeks ago before the startup crash I thought we were at 25%. We are getting better and have more minor fixes in the pipeline.